"Underground," a new television series about the Underground Railroad, debuts Wednesday. Emory professor Leslie Harris was invited to a White House screening of the show to offer her perspective on the history it explores. The White House Office of Public Engagement hosted a panel discussion last month arising from a new television drama "Underground." 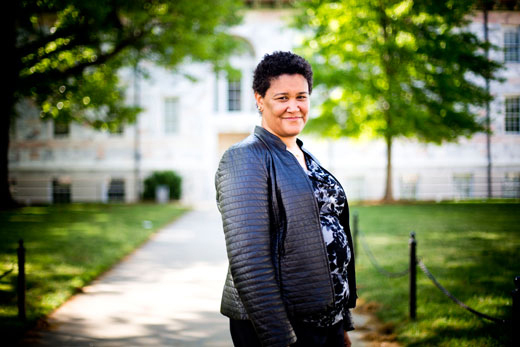 Through her scholarship, Emory historian Leslie Harris has challenged the notion that slavery was largely a Southern phenomenon, with books and writings that have explored its full reach into many Northern communities. So when the White House Office of Public Engagement hosted a panel discussion last month arising from a new television drama "Underground" — an original series set to debut this week that examines the story of America's Underground Railroad — Harris was invited to join the conversation. The event, "These Hallowed Grounds and 'Underground' Screening," was held in celebration of Black History Month on Feb. 22 in the Eisenhower Executive Office Building, which is adjacent to the West Wing of the White House. Harris joined a panel that included archaeological consultant Cheryl LaRoche, a lecturer in the Department of American Studies at the University of Maryland, College Park; Clarence Newsome, president of the Underground Railroad Freedom Center; Salamishah Tillet, associate professor of English and Africana studies at the University of Pennsylvania; and attorney Richard Dana, an adjunct professor of justice studies at Kent State University. Following an introduction by Evelyn Brooks Higginbotham, panel moderator and president of the Association for the Study of African American Life and History, Harris was invited to lead off the discussion about unique perspectives on the Underground Railroad. Although most people may associate the Underground Railroad with rural spaces, through her book, "In The Shadow of Slavery: African Americans in New York City, 1626-1863," Harris examined how the city became a destination for both free black people and fugitive slaves, who found an urban center steeped in both pro-slavery and anti-slavery activism. "We're not wrong to think about rural spaces as the places that enslaved people ran to and through," explains Harris, associate professor of history and African American studies. "But once they reached the North, and even in the South, urban spaces were incredibly important," she adds. "Ships came and went and people stowed away on those ships, and once they came north to places like New York, Philadelphia and Boston, they found community in cities." In fact, Harris notes that New York City had among the largest number of black people during the antebellum period. "There were churches there, there were other former slaves there who helped these new fugitives adjust to life," she adds. "It was a place known throughout the U.S. as a place to run to." The panel was presented before an audience that included actors, producers and directors for "Underground," which is produced by Sony Pictures Television and Tribune Studios. Depicting the fight for freedom and human rights, the series premieres Wednesday, March 9, at 10 p.m. on WGN America. "Underground" follows its characters' quest to escape a Georgia plantation for freedom in the North. The new television series premieres Wednesday, March 9, at 10 p.m. on WGN America. Photo courtesy WGN America. After seeing a screening of the first episode of "Underground," Harris says she liked what she saw. "It looked really well researched and interesting, getting at the emotional anguish of people as they went through slavery, and focusing on a range of interesting characters, from slaves and slave owners, to anti-slavery activists and slave catchers," she says. Harris also had a chance to hear a presentation featuring the show's producers, who include singer/songwriter John Legend, as well as those in front of the camera speaking about the process of creating the series. "The writers felt it was a really heroic story that we as Americans should be proud of, and they question why aren't these stories well known, why aren't we more knowledgeable and proud of these actions taken on behalf of freedom?" Harris says. "That was really moving to hear, their thought process as artists engaging in this historic work," she adds. "As an academic historian, I was impressed." With the development of such projects — including a remake of the landmark television mini-series "Roots" slated for release later this year — Harris finds that "we are in an amazing popular cultural moment about slavery." "There are different people out there interpreting slavery in public, and it's exciting to see that, particularly when it's well done," she says. "I think it's great to see artists take these stories and respect them and want to do right by them." For Harris, being invited to be a part of the program was a particularly moving experience. The event was presented in partnership with the Association for the Study of African American Life and History and WGN America's "Underground" series team in concert with the Department of the Interior.